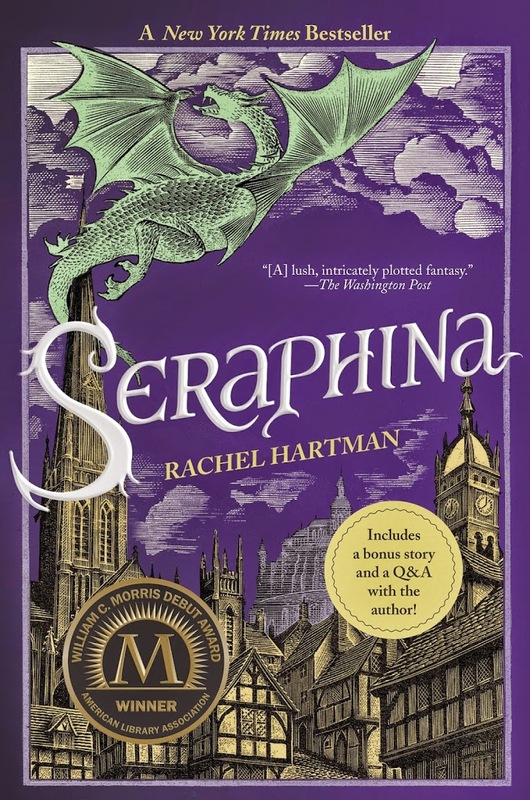 Seraphina is a half-dragon with an ability to have visions of others like her. On Orma’s suggestion, she creates a mnemonic device in the form of a garden that captures the grotesques in their avatars which she then tends to every day. As the assistant to the court’s composer, Viridius, Seraphina is careful not to draw attention to herself. In time, however, Prince Lucian Kiggs is impressed by her knowledge of dragons and asks her to help him find who killed his uncle, Prince Rufus. They find that the killer is Imlann, her grandfather who has been plotting to take over Tanamoot with the help of the 12 generals and by killing the co-founders of the Comonot Treaty on the Treaty Eve. Disguised as Princess Glisselda’s governess, Lady Corongi, Imlann poisons Princess Dione who dies and Queen Lavonda who goes into a coma. In his face off with Orma, Imlann is taken down by the Censors. The generals however, have seized control over Tanamoot and plan to go to war with Goredd. Glisselda and Lucian are shocked to find out that Seraphina is a half-dragon and that there are others like her, but they accept her. In the end, Glisselda takes over the throne, Seraphina readies herself to go in search of other ityasaari, Orma is pardoned by the Comonot but has to hide away from the Censors, and Lucian promises Seraphina that they’d fight the oncoming war with the dragons before doing anything about their feelings for each other. They do kiss once, though. In the prologue, Seraphina reveals that she remembers the time she spent in her mother’s womb and bits of her birth (during which her mother died). In the aftermath of her birth, Seraphina’s father, Claude Dombegh, finds a new wife to cover up the death of her mother and moves back to Lavondaville. When a dropped psalter reveals that Seraphina’s patron saint is the heretic St. Yirtrudis, the priest hurriedly declares that it must be St. Capiti, the patroness of scholars. Afterwards, Seraphina’s nurse glues the pages of St. Yirtrudis together on Claude Dombegh’s command (a common practice due to the fact that St. Yirtrudis didn’t believe in Heaven). Despite being a dragon with no soul, Seraphina’s uncle, Orma saves her life three times. Years pass and Seraphina is now an assistant to court’s composer, Viridius. Seraphina ends up attracting the attention of the entire court when she plays at Prince Rufus’s funeral who was decapitated via a draconian method of killing. Sons of St. Ogdo, the saint of warriors, harass Basind but scatter when captain of the guard, Prince Lucian Kiggs arrive. Due to this event and more, Basind is assigned under the care of Orma to teach the newskin some manners. This is all an act because Basind is actually a Censor sent to spy on Orma and see if he needs to be excised of all human emotions after living among them for so long. The whole thing however, compels Seraphina to speak up for the dragons which attracts Kiggs attention. At Glisselda’s soiree at the Blue Salon, Seraphina spots Miss Fusspots from her garden who’s actually Dame Okra Carmine, the Ninysh ambassador to Goredd. Seraphina is stunned to discover that all the grotesques in her garden are half-dragons like her. Seraphina overhears Josef, Earl of Aspig, recounting the day Prince Rufus was killed which prompts Seraphina to ask how he’s so sure it was the work of a dragon. Kiggs hears everything. In time, Kiggs sees that Seraphina could actually help him figure out who decapitated Prince Rufus. The coin Orma received at Prince Rufus’s funeral turns out to be from his father Imlann’s hoard after which Orma asks Seraphina to inform Kiggs of Imlann’s possible involvement in the whole ordeal. However, Seraphina comes to know about the knights claiming to have sighted a rogue dragon and bluffs her way in order to question the knights and gather concrete evidence for Kiggs than just a coin. Kiggs catches her and is skeptical about Imlann’s involvement so Seraphina sends him a note after meeting with Orma that Sir James Peascod might be able to identify the dragon better. Mistaking that Seraphina plans to go in search of the knight herself, Kiggs agrees to go with her. The next day, Ardmagar arrives at Castle Orison and after sighting him, Seraphina’s memory box starts leaking after which another maternal memory ambushes her. In one of the dressing rooms, Seraphina finds Lars, Viridius’s protegee, arguing with the Josef, Earl of Apsig, who’s actually Kate’s half-brother. Lars is Loud Lad from Seraphina’s Garden. At dawn the next day, Seraphina and Kiggs leave for the valley of Mews River, the hunting route of Prince Rufus. They spot dozens of crows and conclude that it could be a dragon’s cesspit. On inspection, Kiggs finds two horse medals belonging to Prince Rufus’s horse confirming that a dragon killed him. And oh, Kiggs thinks that Seraphina is in love with Orma as he cannot find another reaSeraphina her to have such vast knowledge of dragons. They find the cave of the knights where they meet Sir James Peascod who confirms that the rogue dragon is indeed General Imlann. Imlann set the barn, situated close to the cave, on fire in order to determine if the knights are any good as they were before their banishment in lieu of the Comonot’s Treaty four decades ago. The knights demonstrate drachomachia which is as awesome as it sounds. Snow starts falling as Seraphina and Kiggs start their journey back to the palace however, they encounter Imlann in his dragon form only a few moments into their journey. Imlann stops them because he smelled a saar, which is of course Seraphina, who understands Mootya, the language of the dragons. Seraphina contacts Orma via his earring and proceeds to bluff her way out of the deathly situation (she does slip a little) yet Imlann is apparently satisfied and flies away. Thinking she’s a dragon, Kiggs turns on Seraphina and accuses her of possessing a draconian device; Seraphina tells him that he’s mistaken only to find Orma and Basind landing on a hill close by. Kiggs arrests Orma and Basind for unauthorized transformation and Seraphina for her involvement with dragons. On their way back to the palace, Seraphina realizes she’s in love with Kiggs and in frustration pulls off one of her scales on her arm. In private, if course. Back at the palace, Kiggs hands them over to the Queen and Comonot and turns in for the night. Basind is excused, Seraphina is asked to hand over the transmitting device, and Orma has his scholarship and travel permissions revoked. In private, Orma requests Comonot to get the Censors off his case, but truth about Seraphina comes out and Comonot orders Orma to put himself down for excision in a week. Refusing to have memories of her sister, Linn, and Seraphina removed, Orma plans to travel south and run away. He gives Seraphina the earring back, just in case. Earl Josef is under suspicions since he was absent from the palace when Kiggs and Seraphina went off to meet the knights. Seraphina has a vision of Fruit Bat on fire but it’s just Fruit Bat holding Seraphina’s memory tin. Fruit Bat turns out to be 11 years old Abdo and one of the Pygegyrian dancers trying to contact Seraphina since the funeral. Seraphina recieves another of of Linn’s memory where Linn learns of Imlann’s treason against the treaty; they have a face off where Imlann’s ends up injured. The next day Viridis asks Seraphina to take the dress rehearsal day for Treaty Eve off and tells her that he knew all along that she’s the daughter of Linn. Seraphina discovers that everyone thinks she’s a dragon except Guntard. Princess Dione and Lady Corongi slashes her arm to prove it but are shocked to find it to be not the case as Seraphina’s blood is red not silver. A drunk Seraphina is taken home by her father. She goes to meet Orma the next day who has given Basind the slip. They have a quick goodbye as Basind has followed them and Seraphina distracts him by setting the Sons of St. Ogdo on him while Orma slips away. Seraphina spots the Ardmagar dressed as a monk and decides to follow him into a church where Thomas Broadwick (who once threatened her for buying prohibited draconian devices from quitgl) stabs her in her scales (he was the one who Seraphina saw talking to Earl Josef a while ago). Comonot kills him. Kiggs tells her that he and Glisselda wants her to stay. Believing that Earl Joself is Imlann, Kiggs, Seraphina, Glisselda along with Dame Okra, Abdo and Lars plan to keep an eye all times at Comonot, the Queen and Princess Dione on Treaty Eve. On Treaty Eve, Kiggs and Seraphina are talking when Dame Okra calls them to sort the matter of Comonot wanting to leave early. Alarmed by the absence of the royal family, they sprint off to find Princess Dione who faints under the effects of the poisoned wine right after uttering Apsig’s name. Dame Okra leads Kiggs and Seraphina in search of Queen Lavonda and Glisselda and find them toasting to a new year with Lady Corongi and Earl Josef. Queen Lavonda drinks a sip before they’re stopped by Kiggs and goes into a coma later during the night. Lady Corongi takes Glisselda with her and runs away after seeing that accusing Josef will be to no avail. Lady Corongi is Imlann who takes off towards the sally port and transforms into a dragon with Glisselda on his shoulder. Desparate, Seraphina tries to talk Imlann into taking her instead, tells her she’s his granddaughter, and that Ardmagar and half the royal family is dead. Lars plays his great war pipes to distract Imlann while Abdo climbs on his neck to hold Imlann’s mouth close and Kiggs stabs him in the foot to free Glisselda. Orma arrives at Seraphina’s call and there’s an epic father-son face off as dragons with Abdo holding on to Imlann’s neck. It’s all over when the Censors arrive and set Imlann on fire. Orma is injured and Abdo is safe. Kiggs and Glisselda are shocked to discover that Seraphina is a half-dragon and that there are others like her. Princess Dione, Glisselda’s mother, dies from the effects of the poison. The next day, Seraphina is asked to join a meeting with the dignitaries from other countries, Princess Glisselda, Claude Dombegh as well as Lars and Abdo. The generals have seized control of Tanamoot and demand Comonot’s immediate return to his country if they want to avoid a war. Claude Dombegh comes clean about marrying a dragon. The meeting decides that Goredd, Samsan, Porphyry, and Ninshy will together go to war with Tanamoot for peace. Seraphina goes to the infirmary to bid goodbye to Orma who’ll be leaving with Eskar (a former Censor) to hide and avoid excision by the Board of Censors. (It’s a very emotional goodbye, I cried). Glisselda and Seraphina have an emotional moment after which Glisselda sends her to fetch Kiggs. Seraphina arrives in Kiggs tower to find him in the balcony. Seraphina tells him everything about her life and professes her love. Kiggs tells him about his life and how he was lost until he heard her sing at her father’s wedding which prompted him to investigate the truth of things. Seraphina and Kiggs sing that song again and it is beautiful. Kiggs kisses her scales on her arm and Seraphina kisses him on the lips. They decide to not act on their feelings as Kiggs might very well have to marry Glisselda (being engaged to her and all), the fact that they’re going at war with Tanamoot, and that Seraphina will be going off in search of other half-dragons. In the end, Seraphina finally feels like she belongs. Comonot’s Treaty – An agreement establishing peace between Goredd and all of dragonkind. Dracomachia – The Goreddi form of martial art that St. Ogdo invented to fight dragons. Ityasaari – Human-dragon hybrids in Porphyrian language. Grotesques – Mental avatars of the half-dragons that Seraphina has visions of. Mootya – The language of dragons. Newskin – A dragon who’s not experienced at taking human form and living among humans. Patron saint – Key figures in Goreddi religion, patron saints are assigned to infants when they drop the psalter to reveal the specific saint’s page it opens to. Psalter – Book of illustrated devotional poetry for every major Saint. Quigutl – Subspecies of dragons who are unable to transform, are flightless with an extra set of arms. Saar – Dragon in Porphyrian language. Saarantrai – A dragon in its human form (plural: sarantraas). Sons of St. Ogdo – A group that’s unhappy with the treaty and despise dragons. I just finished Shadow Scale and was heart broken when I began to realize it was NOT a trilogy. I loved those characters and could have read about them indefinitely!